My praxis evolved from the investigation of my life in close proximity to animals and the interspecies relationships therein. My processes focus in the area of overlap, the social, physical and the psychological interactions; a duality of the human/animal relationship. 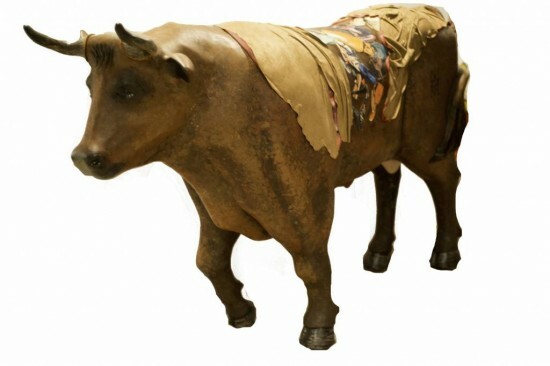 This project examines metaphysical elements of the interspecies human and nonhuman relation with the oxen., reinforcing the reality that most peoples’ relationship with most animals is solely to eat them or wear them. Poor Oxymoron, he is a contradiction unto himself, beautiful in life and even more sought after and beautiful to others in death. He is the antithesis of metaphysics whereby something is evolving to or from nothing. In this instance he is devolving from a beautiful sentient being into items sought after, eaten, and enjoyed by humans and other nonhumans. He is happy in his life; others take happiness from his death. While he is living, his senses enjoy the warm sunshine on his hair, cool water of a stream on his tongue and hooves and the comforting pat from a human caregiver. After his days of usefulness as a beast of burden, his life is over. With slaughter comes the end of his idyllic days. The human’s senses now enjoy the taste of Oxy’s steaks, chops and ribs. They caress his soft hide made into handbags, shoes, jackets and gloves, all with the smell of fine, rich leather.